Many students who participate in Cherry Hill High School East’s spring musical saw the musical “Beauty and the Beast” on stage as children. Some of them saw it performed at Cherry Hill East nine years ago, others had seen the show elsewhere, and a few others performed in the show for other theaters. All of the students’ eyes light up as they talk excitedly about their favorite characters, scenes and musical numbers from the show. 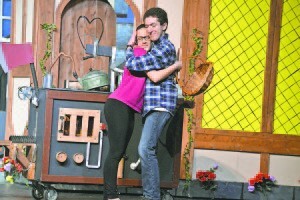 On Friday, the cast will get to actually play their favorite characters in front of a live audience as Cherry Hill East Theatre premieres “Beauty and the Beast” as its spring musical on Feb. 26. Two casts will perform the shows, with the red cast taking the stage on Feb. 26 and 28 and March 5. The white cast will perform Feb. 27 and March 4 and 6. Director Tom Weaver said the theater department wanted to do a kid-friendly spring musical and felt “Beauty and the Beast” would capture the attention of a large audience. For the cast, the opportunity to perform as their favorite Disney characters was a once-in-a-lifetime opportunity. Aylesworth said Belle was always one of her favorite Disney princesses as a child because she loved to read. For senior Samantha Mautner, playing Belle in the red cast, she is excited for the character brunch scheduled for Saturday, March 5. At the brunch, the cast will do a meet and greet as their character with guests. For members of the senior class, this is the second time they are a performing a Disney show at Cherry Hill East. The theater department performed “Peter Pan” as its spring musical in 2013. Many of the cast members said there is a little bit of pressure going into the show, especially performing what is expected to be an audience with a lot of kids. The biggest challenge so far has been choreographing the show’s elaborate dance numbers. Weaver credited assistant director and choreographer Sandi Makofsky with guiding the cast through those scenes during rehearsal. Makofsky said trying to replicate the style of Disney is a big focus during rehearsal. A lot of time and energy is put into the dance numbers. Makofsky puts a lot of time in analyzing each dance number for every cast member. Some of the cast members have faced challenges with their characters as well. 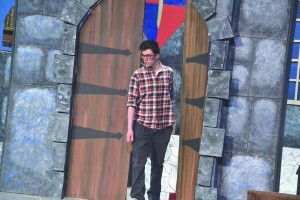 Senior Avi Natan, playing the Beast for both casts, described his character as complex, especially early in the show when his character is an animal. Junior Cedric Middleton, playing Gaston in the red cast, said his character is different than previous roles he’s played. Junior Jacob Ropka, playing Lumiere in the red cast, has a challenge no other actor in his cast has. The choice of “Beauty and the Beast” has generated a lot of interest in the Cherry Hill East community. 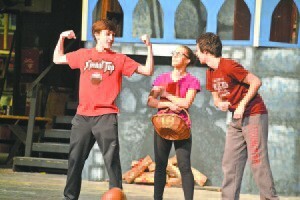 The cast said many students who don’t normally attend shows are planning to see this year’s musical. “It’s exciting to know we’ll have a full house and we’ll draw from a large pool of people,” said junior Jared Camacho, playing LeFou in the red cast. Performances for “Beauty and the Beast” will take place at 7:30 p.m. on Feb. 26 and March 4, and 2 p.m. for all other shows. Tickets are $14 for adults and $12 for students. To purchase tickets, call the Cherry Hill East Theatre box office at (856) 424–2222 ext. 2019. The box office is open on weekdays from 10 a.m. to 1 p.m. and an hour prior to each show. Brunch with Belle will take place on March 5 at noon prior to the show. Tickets for the brunch are $23.50 for adults and $21.50 for kids and includes tickets to the 2 p.m. show. Tickets can be purchased at http://chetb.weebly.com/store/c3/Events.html. Guests must RSVP for the brunch by Feb. 26. Call Val Aylesworth at (856) 295–1795 or email events.cheboosters@hotmail.com with any questions.